Materials of Hood Inner Stainless steel working structure. Safety tempered Sliding glass door. Heavy duty synthetic ceramic working table. Slide Type Sash Door With tempered safety glass and multi-purpose cabinet stand. 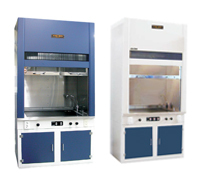 Practical and Reliable General chemical gas hood with high thermal, chemical resistance, various material for user selection.